OnlineWhitepapers.com (OWP) announced it will exhibit at the Content Marketing World Conference and Expo for the first time in September. The site will introduce new submission plans, promote the benefits of companies using whitepapers to increase their global marketing impact, and release a new mobile app. Powered by Bython Media, OWP is the largest digital library of B2B whitepapers from major companies in written, video, and interactive formats. Downloads are free, and the search function makes it easy to find topics professionals need to navigate the evolving world of technology for their companies and their careers. The site also offers submission plans for companies to connect with those professionals. Publishing with OWP helps reach millions of decision makers, establish thought leadership, find customer opportunities, build brand awareness, and generate GDPR-compliant leads. Submission plans include a free Basic option, the popular Standard offering, and an Enterprise package for larger corporations with multiple users. Each plan comes with a dashboard that provides real-time analytics to help gauge whitepaper marketing performance. OWP will offer a show special at the CMW conference. Attendees can publish their whitepapers for free under the Standard Plan (normally $999) if they drop by Booth 440. The site will also introduce a new mobile app. The app gives users the ability to search and research whitepapers right at their fingertips. They can stay informed by reading trending topics or watching informative videos anywhere at any time. 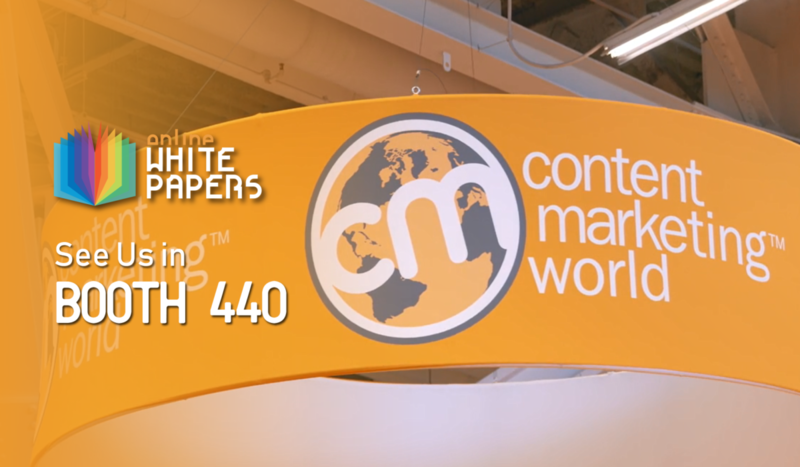 To learn more about the power of whitepaper marketing, and to schedule a meet-up with OWP experts at CMW, go to OnlineWhitepapers.com/Content-Marketing-World. For the latest whitepaper additions, subscribe to the OWP newsletter and follow OWP on social media. OnlineWhitepapers.com is part of a larger Bython Media network. OWP and its partner site, TechFunnel.com, provide content that helps businesses grow, adapt, and succeed in the constantly changing realm of technology and related topics. Based in Frisco, Texas, Bython Media is a global digital publishing and marketing company. Its online properties deliver first-class content on technology and research. Bython’s marketing arm provides data-driven solutions that connect clients with customers on a deeper level and amass high-quality leads through a network of almost 30 million contacts. Visit bython.com.